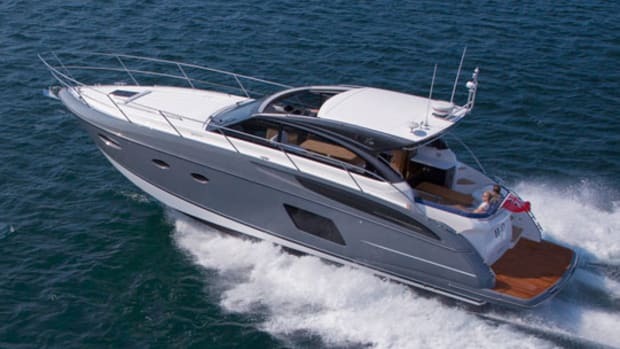 Like her siblings, the new Maritimo M50 is designed and built for boaters who really use their boats. I’ve tested a number of Maritimos over the years, and my perception of each has been colored by two things. One was seeing them built in the factory in Coomera, Queensland, Australia, and visiting the foundry where Maritimo once cast its own struts and props. Here I saw the trademark monocoque structure—hull, deck, and full interior liner—bonded together, all the way back to the saloon, creating a structure that’s virtually impervious to torquing and twisting. 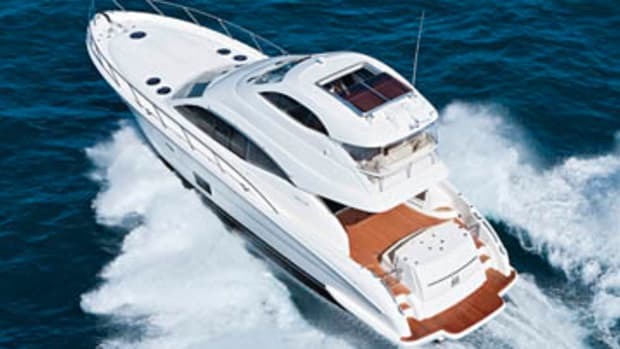 The engine room has its own liner to which the mufflers and exhaust system are bonded. That’s why every Maritimo I’ve run has felt so solid. Slam it into a wave, and there’s no shake or shudder, just a solid thunk, like a pro lineman hitting a blocking sled. The other thing is the Maritimo owners I’ve met. They really use their boats. I mean really use them. Like the couple I met in San Diego who’d just capped their return from Puerto Vallarta aboard a 48 with a nonstop run from Cabo to Ensenada. Or the couple I met in Seattle who’d just finished their third Inside Passage and were trading their 45 for a 50. Or the Canadian I met in the Turks and Caicos who makes the run from down there every year with just his wife and a hired crewmember. If you look at the M48 and M50 side by side, you won’t notice much difference. 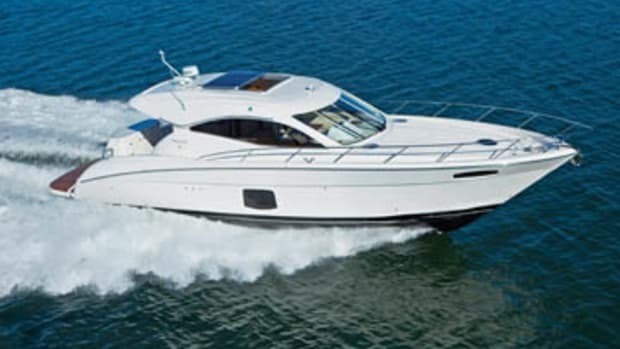 Both have the enclosed flying bridge with sliding sunroof and aft balcony, a design element that is a trademark of Maritimo cruising models. And both also have full walkaround side decks, and a transom console flanked by walkways that lead to a deep integral swim platform. If you’re sharp-eyed, you might notice the 50’s bridge balcony is bigger (by 15 percent, to be exact) and her hull has more windows. The reason for the similarity is that Maritimo is concerned less about styling and more about substance. 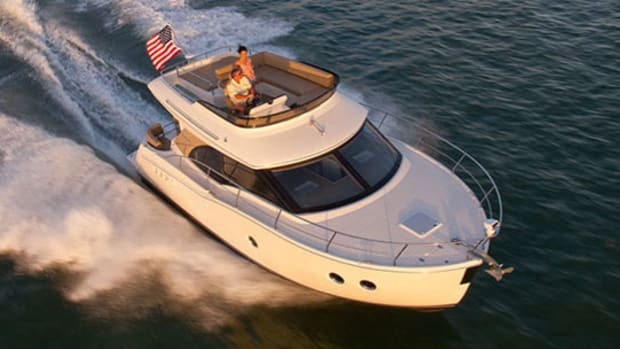 Since its owners run their boats hard and often, the focus is on making them as cruiser-friendly as possible. 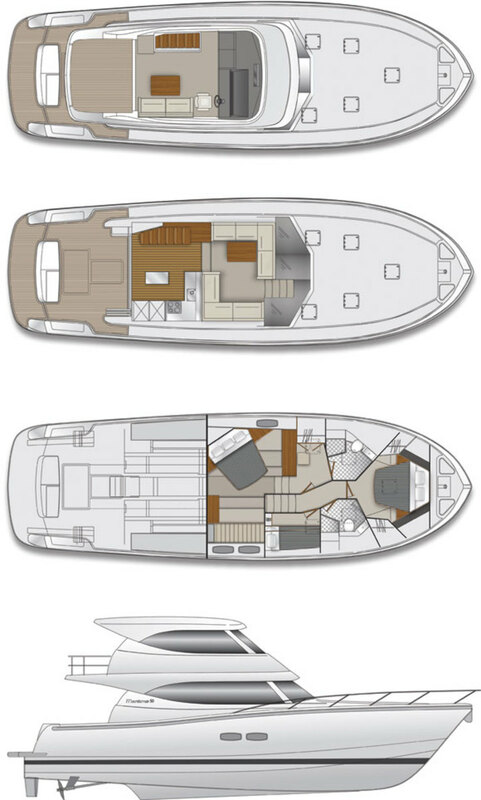 In the case of the 50, that means replacing the 48’s port-side master with a full-beam one that’s significantly larger and offers a king-size berth angled to centerline to maximize room and provide more windows—one to port and two to starboard. The bigger master is aimed directly at those cruising couples I mentioned. Fortunately the extra room comes at no visible cost. 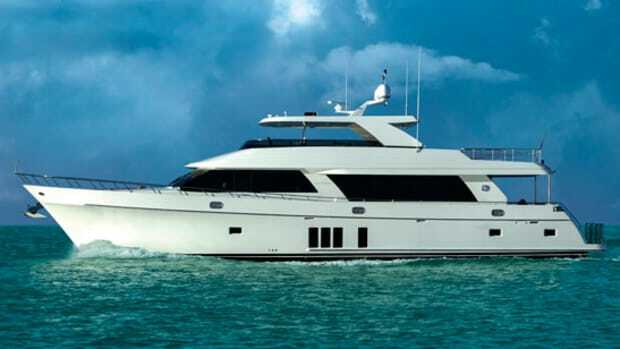 There are still three cabins in total, two heads (including en suites for the master and bunk room), and sleeping for six, including a marginally smaller VIP in the forepeak and bunks to starboard. And there’s still 6 feet 8 inches of headroom throughout, lots of elbow room, and plenty of stowage. On the main deck things are again familiar. The galley remains to starboard and aft (for easy cockpit dining), L-shaped, and centered on an island. Also unchanged is the bridge stairway—to port, just abaft an L-shaped settee. The biggest improvement on this level, and a smart one, is the glass partition that leads to the cockpit: It now folds and stacks unobtrusively to starboard instead of being two bifold doors that meet in the middle and stack to either side, making it possible to turn the saloon and cockpit into a single-level space. Since this will mean more traffic between outside and in, the after part of the saloon is easy-to-maintain wood instead of carpeting. The hull is new—2 feet longer and 4 inches deeper than the 48’s—which allows for a saloon that’s nearly 10 percent bigger and a cockpit 4 percent larger. It still features a keel that tapers out of the stem, then disappears just forward of the shafts, a combination that gives admirable tracking and good slow-speed maneuverability. A fine forefoot and fairly full foresections make for good seakeeping, something that became clear to me on a test day that brought nasty, steep 3- and 4-footers. Even headed into them at full throttle, my 50 never pounded and always felt as solid as a hunk of marble. Part of the reason for that is balance. 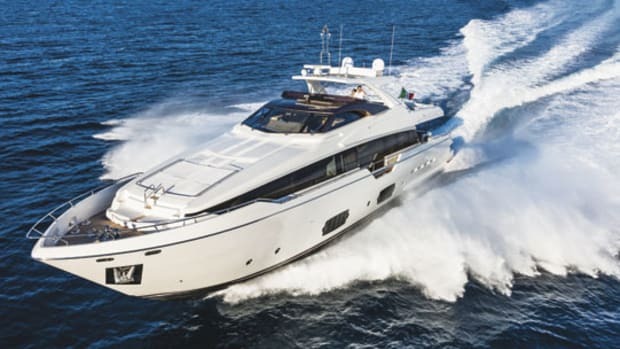 Maritimo has always placed its fuel tanks on the center of balance, between the engine room and the accommodations. That ensures constant running trim as fuel burns off, but also restricts what designers can do with the accommodations. On the 50, the fuel remains on the center of balance but is in saddle tanks, outboard of each engine, hence the roomier accommodations. Better yet, fuel capacity is up by 75 gallons. Performance is also balanced. 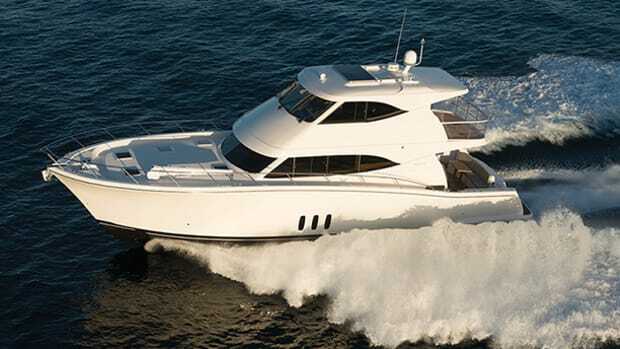 Test power was the standard pair of 670-horsepower Volvo Penta D11s—same as the 48—which yielded a top speed of 28 knots. But this is no runabout; she was born to cruise, and so a 1750-rpm lope will give you 19.1 knots and nearly 0.5 nmpg. Thanks to generous fuel tankage you can safely travel 453 NM between fuel stops at that speed. 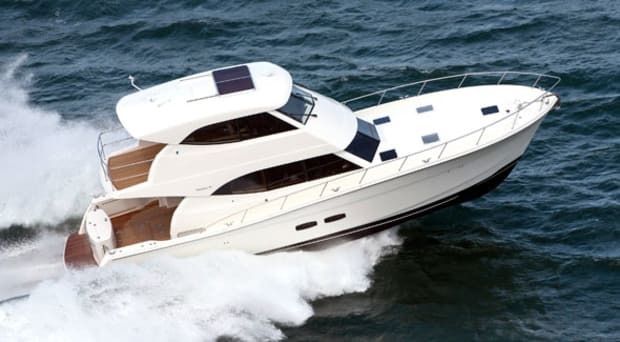 In crafting a replacement for its venerable M48, Maritimo eschewed wholesale changes in favor of judicious fine-tuning. 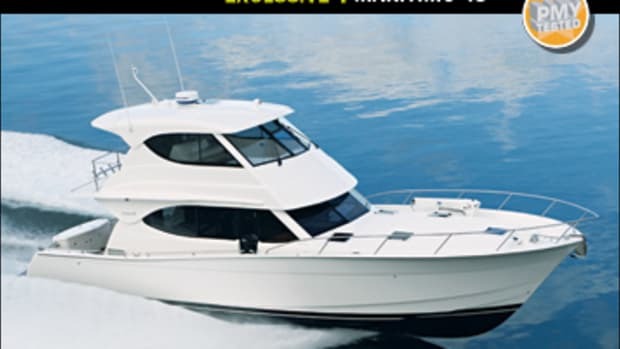 It could do that because it had a great platform to build off of, one crafted in the knowledge that its owners won’t be spending time aboard dreaming about adventure but going to sea and living their dreams. NOTEWORTHY OPTIONS: Fisher & Paykel dishwasher ($1,995); Glendinning CableMaster ($3,900); Stidd helm seats ($6,900); teak decking on balcony and swim platform ($8,900); LED underwater lights ($3,400). 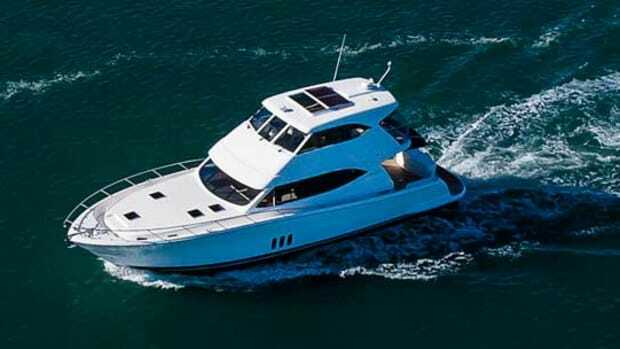 The Maritimo M50 is a rugged cruiser designed for real boaters. We’d love to cruise her from Southern California down to Cabo San Lucas so we could test her mettle against the mighty Pacific—and maybe discover the perfect fish taco shack along the way. Like us on Facebook and let us know what adventure you’d like to take aboard the M50. 333 gal. fuel, 211 gal. water, 2 persons, 500 lb. gear.